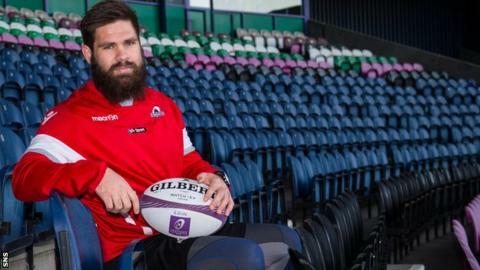 Edinburgh will have no security concerns playing their next European Challenge Cup game in France, says South African forward Cornell du Preez. Several sporting events were called off after last week's attacks in Paris, and Edinburgh are away to Agen on Friday. "Personally, I don't have any and I don't think anyone else will either," said Du Preez when asked if he had any concerns about his safety. "I don't think we can live our lives in fear." Sunday's European Champions Cup match between Stade Francais and Munster has already been postponed, but Edinburgh have travelled to the south of France for their match. "Everyone in sport sends their condolences for what happened, but for us it is just to go out there and play a game and not think about anything else," Du Preez told BBC Scotland. "Security will probably be a lot more strict now after all these things happened, but they are just things that happen and we've got to go out and work." Du Preez says it is difficult to predict how last week's events in Paris will affect Agen's players, whose side sit bottom of the French Top 14 and lost their opening pool game 48-10 away to London Irish on Saturday. "Personally, I wouldn't know how to feel," he said. "They might want to come out emotional and passionate, but we'll just see what happens on the day. "It's difficult to play in France as they are always up for their home games and they pick their best teams for their home games. "So it will definitely be a tough encounter. They love to play with flair and momentum and it's difficult to stop them once it gets going." Edinburgh opened their European campaign with a 28-10 win over another French side, Grenoble, last Friday. "We started off quite well last week," said Du Preez. "They were not great conditions to play in, but I think we were decent enough to get a good win." The Pro12 side lost to Gloucester in last season's Challenge Cup final, but the South African thinks the Scottish side have the capacity to go one better this season. "We are better prepared, from a fitness point of view as well," added Du Preez. "We did a lot of work in pre-season, particularly on our skill work. "We've got a real good squad with a lot of depth. Everyone contributes to the team and we have a lot of talent as well."